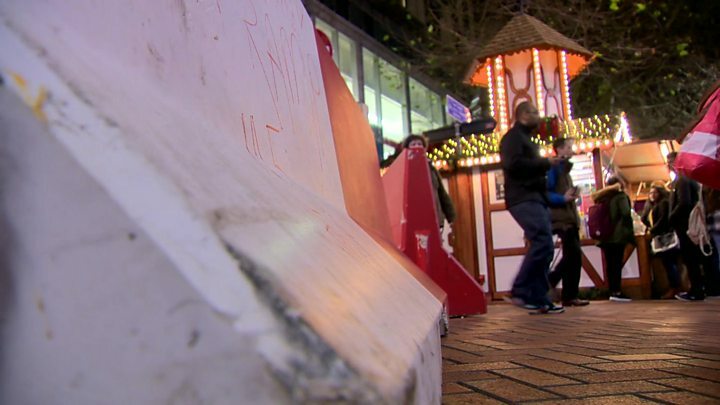 No-one should be surprised that a Christmas market was attacked or even the way the attack was carried out. But even if the tactics and target were predictable, the security challenges in defending against it remain real. As far back as 2000, a market in Strasbourg was targeted by al-Qaeda in a bomb plot which was foiled. For jihadists, these markets - a long tradition in many parts of Europe - offer a large number of locals and tourists crowded in a public place as well as the symbolic and emotional impact of striking in the holiday season. Just a few weeks ago, a radicalised 12 year old was reportedly arrested in Germany with a plan to set off home-made explosives at a market in his home town. The nail bomb is said to have failed to detonate. And the methodology of this attack is also not new. Two years ago a van was driven into shoppers at a Christmas market in the French city of Nantes, leaving 10 people injured. One person later died. Jihadist group Islamic State (IS) and al-Qaeda have both called for the use of vehicles as weapons and the attack in Nice in July was the clearest sign of the terrible damage a lorry could wreak when 86 people were killed. In that case, the driver may have been inspired by IS jihadists but the extent of direct contact seems to have been limited. Vetting every lorry driver is not a solution especially, as seems to have been the case in Berlin, a vehicle was hijacked just hours before it was used. The challenges in preventing such low-tech attacks are complex. A decade ago those working with al-Qaeda tended to plan more complex attacks involving explosives. This often required international travel and training as well as communication and such plots took time to develop. This all provided potential opportunities for intelligence agencies to learn about the plans and interdict them. If an individual is inspired by IS but not in touch with them and acts either alone or in a small cell, then it can be harder to spot them. By the time they hijack a lorry, there may be few chances to find them. The only hope in that case is protecting sites from an attack to reduce the possible damage. The UK has invested extensively in trying to protect crowded places. Advice is published by the National Counter Terrorism Security Office to those looking after security at buildings, pubs, bars and visitor attractions on how to protect themselves. Much of that historically has been about protecting against car bombs or what is called "a marauding firearms attack" - the kind of incident seen first in Mumbai and more recently in Paris. The concern over car bombs has led to investment in bollards, obstacles and chicanes - sometimes integrated into local architecture rather than overtly visible - which would make it harder for a vehicle to ram a building at speed. There is also increased surveillance at public events and liaison by organisers with police to prepare. Markets are still hard to protect, partly because they tend to be based in open squares and streets but are also temporary in nature - making it less likely that there will be investment in heavy, permanent security, although temporary barriers can still be used. British police forces say security plans were already in place for markets in the UK and these will be reviewed and in some cases adjusted, with Greater Manchester Police increasing their presence. Counter-terrorism experts caution that relying purely on protective security is not enough. "More bollards and troops on the streets is absolutely not the answer to this threat," Richard Walton, who was in charge of counter-terrorism at the Metropolitan Police from 2011 until the start of 2016, told the BBC. "You have to build your intelligence capability more. You have to encourage people to come forward and in particular you have to encourage the Muslim community to come forward and trust the agencies and report information and concerns they have got". There may be questions, though, as to whether enough was done in Berlin given that this threat was known about. The US state department issued a warning in late November telling American citizens to exercise caution at "holiday festivals, events and outdoor markets". 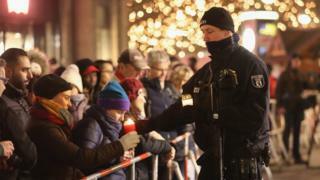 Increased security was put in place at some Christmas markets, such as the more famous one at Strasbourg, with checks on people and restrictions on vehicle movements. But one risk is that if all markets are not secured to the same standard, it might simply divert an attacker to a less well-defended target. German officials have sought to defend their preparations, especially since there do not appear to have been obstacles capable of stopping a lorry in Berlin. "Christmas markets can't be turned into fortresses," one German official said the day after the attack. "We have an unlimited number of soft targets. There are so many possibilities to attack with a lorry and kill people."